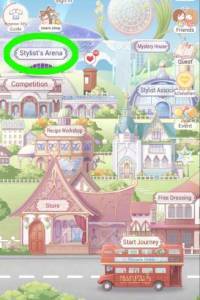 From the main hub, you'll have direct access to the Stylist’s Arena -- just by the top left portion of the screen. This is mainly the PVP section of the game. Where you enlist yourself to take part in a specified theme, you basically battle other players by dressing up according to suggested motif. Your overall score will be based on the styling of clothes, tags, as well as your current skills. You'll probably notice this as you earn different scores even when wearing the same outfit. Depending on the opponent and their choice and level of skills, you'll notice significant difference in overall points. Similar to the challenges in the story mode, your overall score will be based how you managed to balance the 5 style categories. Depending on the given theme, you'll notice some difference in a particular categories' weight identified by the "+++" signs. There are 5 free challenge attempts per day but you have the option to purchase more with diamonds. A theme's duration lasts for a week, and usually ends/refreshes every Monday. All participating players will get a level down after the season is concluded. If by any chance you win, you'll get diamonds, gold, or starlight coins in return. Starlight coins are used to buy recipes or materials (from the Store of Starlight) which then in return be used to craft some truly unique items to add to your wardrobe. 1. Always check Momo’s predictions. Although not particularly accurate, it is a good measure to exceed his predictions by at the very least 20,000 points. 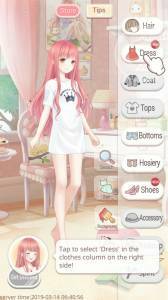 If you are up to the task, you should take note of each and every highest score you'll be able to pull off with your wardrobe for each theme. This way, you'll know easily whether you'll be able to beat an opponent lined up against you. If by any chance Momo predicts a close battle or one that you're hopeless to win, simply select the "Exchange for one" button to switch to another opponent, until you find one that you can easily beat. 2. Know that this game has IAPs in place -- which means a lot of players that are ready to shell out some cash can easily purchase more attempts. If you are up to the task, you may use your diamonds to purchase more attempts, but do this only after you've managed to collect a number of high scoring apparels. Otherwise, you're only wasting those precious diamonds.